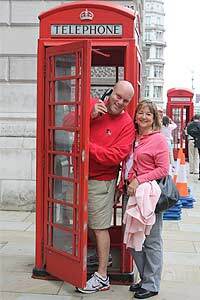 The Mowrey family’s trip to London last summer took in all of the typical tourist stops -- Windsor Castle, the Tower of London and a little shopping at Harrods. But there was nothing typical about how they paid for this incredible vacation. The hotel and flights cost the Maryland family of four next to nothing, thanks to their strategic use of reward credit cards. Mowrey accumulated those points from her Starwood Preferred Guest Credit Card and membership in the Starwood Vacation Network. They purchased their Virgin Atlantic flights with her husband Jeff’s American Express credit card reward points. Since that airline has a fuel surcharge and assesses taxes and fees, the tickets weren’t free. They cost about $800 a ticket — a steal for international airfare during the prime summer months. “We looked at it as severely discounted first-class tickets,” says Mowrey, noting that first-class tickets were running about $4,500 at that point. This wasn’t a once-in-a-lifetime trip for the family. They’ve flown to China, Turkey and Peru on credit card reward points, too. Mowrey estimates that she and her husband figured out how to make the most out of credit card reward progams 20 years ago, soon after they learned about them. Once they determined that free or deeply discounted travel was their goal, they figured out that applying points toward expensive airline tickets were their most profitable use. “We save membership rewards for international travel and save them for business and first-class,” Mowrey says. She notes that their first-class tickets to China would’ve cost about $12,000 — a luxury they wouldn’t have been able to afford otherwise. The Mowreys buy any tickets under $350 — using a rewards card, of course — although they have used points for upgrades, especially for longer cross-country flights. They’ve also gifted points to family members for trips and upgraded their tickets. The Starwood American Express earns one Starpoint for each dollar spent, and it’s Mowrey’s go-to credit card for typical expenses such as groceries, gas, dining out, clothing and haircuts. If a retailer doesn’t accept American Express, she uses a US Airways credit card that she applied for when the airline had a hub in nearby Baltimore. Her husband, who is self-employed, has separate American Express cards for personal and business use, but both contribute to the same rewards account. Buying a new car provided an unexpected boost to his point total when the dealership allowed them to charge up to $5,000 of the purchase price. Of course, the Mowreys make sure they can afford however much they charge. To avoid spending more than they can pay off each month, Ann Mowrey monitors their bank and credit card accounts daily. If her balance seems high, she cuts back on spending for that month. Accessing her accounts often also allows Mowrey to see any special offers that credit card companies are promoting. Doing that allowed her to take advantage of Starwood promotions that allow her to earn free nights after a certain number of stays. The couple is always plotting their next adventure. In the works: a 2012 trip to Paris to celebrate their 25th wedding anniversary. Read the fine print. Really check out your credit card’s rewards program, so you know all of the benefits. Maximize points. “Look at them and say, ‘What’s a better way to do this?’ ” You may be able to use your points directly with a credit card’s partner airline and spend fewer points than going through the credit card itself. Plan ahead. Airlines have a limited number of free seats available on each flight, and everyone wants a coach seat since they require fewer points. Be methodical. Always travel on the same airline — you’ll build up your point bank faster.